Toon Boom Harmony 10.3 Documentation: What Happens when you Export a Palette File? What Happens when you Export a Palette File? It is important to understand what is happening to a palette file when the scene is exported. Because of the Harmony client-server configuration, all of the data can be shared through all of the scenes via the central database. This also includes the palette files, even if they are stored at the Element, Scene, Job, Drawing or Environment level. This way, the palette files can be accessed from any scene of any project. When you export scenes from Harmony using the Control Center, either to archive them or to send them to other users or studios, the palettes stored in external scenes, jobs or environment will NOT be exported. An exported scene will only carry palettes stored in its own Element's palette library, Scene's palette library, Job and Environment. Any other palette from other Environments, Jobs, Elements or Scenes (even from the same job) will NOT follow. Instead a recovery palette will be created when the scene is reopened in another Harmony system. A recovery palette is a local palette created by the system when palettes and colours are missing. This palette is no longer shared with the rest of the project because the original link is broken. For example, look at this chart. 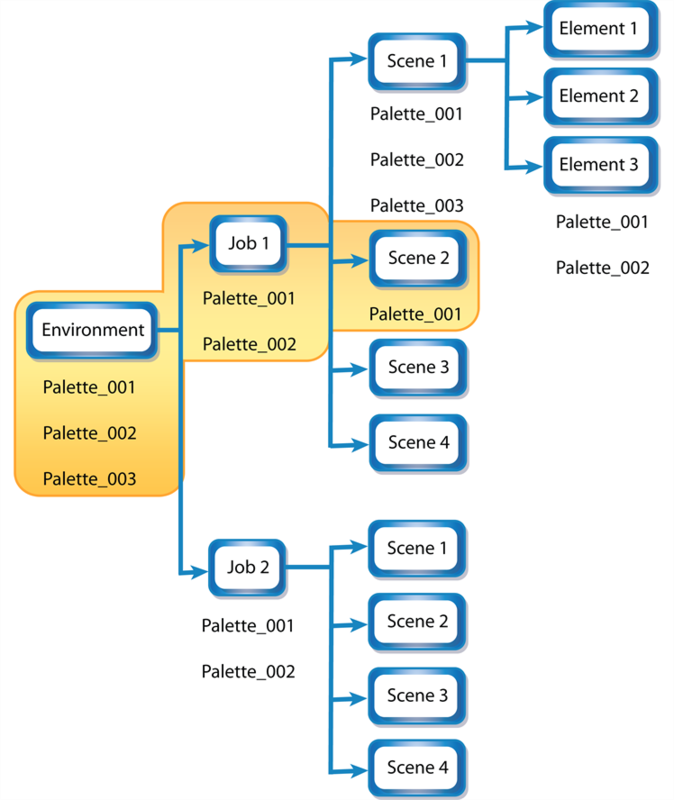 If you export Scene 2 from Job 1, the package will carry the palettes from Scene 2, Job 1 and Environment. It WILL NOT carry the palettes from Element 3 in Scene 1, Scene 1 and Job 2. If Scene 2 was linked to any of these, the system would create a recovery palette the next time that Scene 2 is opened in another Toon Boom Harmony system. If you want to store your palettes with your colour models, you can use the Element level. However, this will require more structure when exporting the different scenes of your project. The scenes will have to be exported along with the colour model scene. Then, the other studio you are working with will have to recreate an identical structure to yours, to be able to import the received scenes into the same location as you did. This will ensure that the links are maintained.